Barrick Gold, First Majestic Silver, Coeur Mining, Silver Wheaton, and Hecla Mining have been scorching hot over the past year. 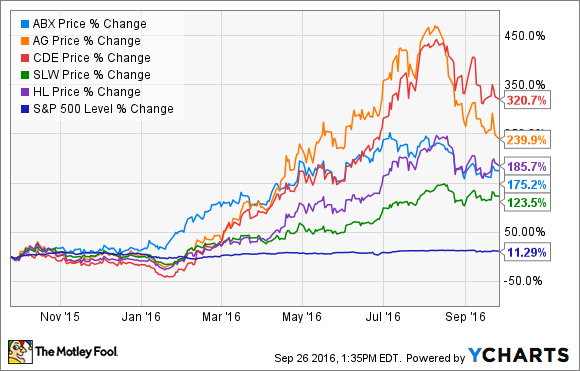 Here's why these stocks have more than doubled investors' money over the past year. New York Silver Price data by YCharts. Several factors are driving up precious metal prices. Interest rates no longer seem poised to increase as quickly as initially anticipated, which was weighing on the prices of gold and silver because neither pays investors any income. Meanwhile, global economic uncertainty is growing, caused in part by Britain's decision to leave the EU and increasing concerns that global growth could slow. Finally, the political and economic direction of the U.S. remains up in the air, thanks to the upcoming presidential election. While those factors are driving demand for tradeable gold, actual demand for physical gold is rising, too. India, which is the largest buyer of gold, started buying again after a strike by jewelers tamped down demand for the precious metal. Meanwhile, investors in the U.S. are piling into gold coins in record numbers, while central bankers are adding to their gold inventories, with demand up 28% year over year. Silver, meanwhile, tends to be moderately correlated to the price of gold because some see it as a poor man's gold. That said, industrial demand, which accounts for 50% of the market, is growing and expected to expand by 28% from 2014 through 2018. Demand for silver by solar panel makers is particularly robust, up 23% last year. 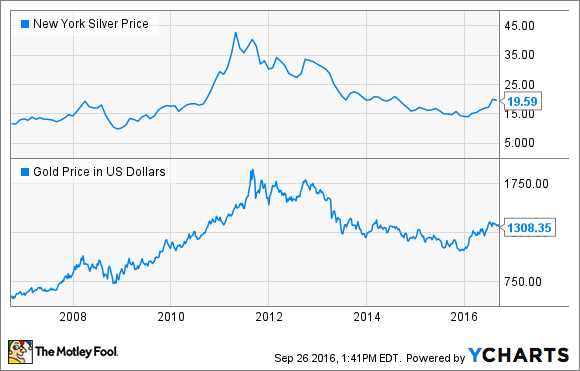 Rising silver and gold prices are coming at the perfect time for miners. That's because several spent the past couple of years working to get their costs down to improve profitability. For example, First Majestic Silver's all-in sustaining costs plunged 23% year over year, caused in part by decreases in sustaining capital expenditures, as well as the addition of the low-cost Santa Elena mine. Meanwhile, Coeur Mining's general and administrative expenses were down 12% year over year, thanks to its cost-cutting measures. These cost savings are enabling miners to capture much higher margins. For example, First Majestic Silver's average realized silver price was virtually unchanged last quarter from the prior year, and yet mine operating earnings nearly tripled on just a 1% increase in output. Furthermore, many miners are taking advantage of rising prices to strengthen their balance sheets, which is relieving a weight that had been holding down their stock prices. Barrick Gold, for example, sold several non-core assets, enabling it to pay off $968 million in debt so far this year and putting it on track to meet its full-year target of $2 billion in debt reduction. Coeur Mining, meanwhile, took advantage of its rising stock price to issue equity and pay off $100 million in debt earlier this quarter, which cut its debt by 20%, saving the company $9 million in annual interest expense. Finally, several miners brought new expansion projects online within the past year, driving robust earnings growth. For example, Hecla Mining's silver production is up 71%, while its gold production is up 41%, thanks to the opening of the San Sebastian mine, as well as organic expansion across all its existing mines. That combination of rising production and prices drove a stunning 164% increase in adjusted EBITDA. Meanwhile, Silver Wheaton's gold sales jumped 40% last quarter to go along with 5% growth in silver sales. That incremental output helped drive Silver Wheaton's operating cash flow up 23% year over year. Those catalysts enabled these miners to capture wider margins and/or higher volumes, driving their financial results to a greater degree than rising precious metal prices alone.